Cheddar Cheese Curds, Jalapeño Peppers, and Breaded Mushrooms, which now contain trace amounts of egg and soy, and two Farm Rich Meatball varieties, Original Homestyle and Italian Style, are no longer gluten-free. "We are continually looking for ways to improve the taste and authenticity of our products," said Shannon Gilreath, Farm Rich Director of Marketing. "We do this while adhering to the highest manufacturing standards and protecting the health and safety of our customers. We want to make sure everyone who enjoys our snacks and appetizers is well-informed about any changes to our offerings." According to the FDA, the eight common food allergens are milk, peanuts, eggs, fish, shellfish, soy, tree nuts and wheat. Cheddar Cheese Curds, Jalapeño Peppers and Breaded Mushrooms contain eggs, soy, milk and wheat. Homestyle Meatballs and Italian Style Meatballs contain soy and wheat (gluten). For general food allergen information, visit www.FoodAllergyAwareness.org. A division of Rich Products, Farm Rich is one of the nation's leading frozen snacks and appetizers brands. The company is based in St. Simons Island, Ga., and features a full portfolio of frozen snack, appetizer and bakery products sold at grocery and club stores nationwide. Farm Rich Snacks are Real-Life GoodTM, made with wholesome, great-tasting ingredients the whole family loves. 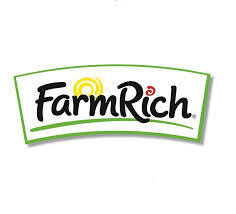 For products, nutritional information, recipe inspirations and more, visit FarmRich.com.